In v10, variables are only calculated when they are needed, for example even if �brake pressure� is active in the variable manager, if it is never used then it is not calculated which saves CPU time. The way memory is allocated to variables has also changed, in that all variables are always available, however they can still be �disabled� in the variable manager which stops them being listed elsewhere is the software. Manually activated variables. In this case the user is left to decide which variables are on. This gives the most flexibility, but new users might find it confusing. Automatically activate all variables with data. In this case the system detects when a variable has data in when it has the variable is activated, where there is no data then it is deactivated or hidden. Note that the above schemes are not quite as simple as they first appear. In the simple case they work well, for example if you have an ECU interface that outputs Exhaust temperature then this variable will automatically be come active, otherwise it remains hidden. However there are many more complicated scenarios. 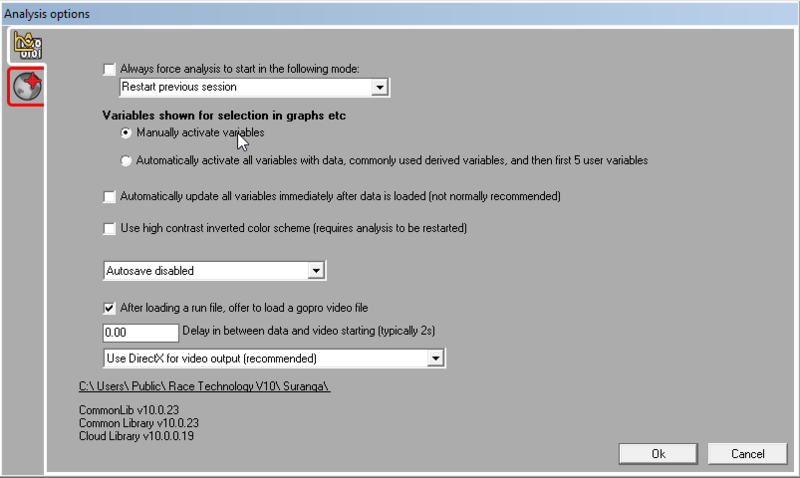 Note that if you want a different selection of variables (for example time into lap, torque etc etc) then the only option is to use the manual variable selection method. Automatically calculate acceleration, distance, and mapping when data is loaded. Typically these variables are nearly always needed, so it makes sense to calculate them immediately rather then delay until you try to use them in the software. Automatically update all variables. This forces everything to be calculated, which means that all the variables are ready for use immediately. For some applications this can be preferable, for example if there are very few variables active or for very short data sets, however normally this is not required and slows down the data handling when you load a new run. These option control whether variables are listed in the variable manager only when they have data, or always. Again, the choice depends on the users preference. Hiding variables that have no data available makes the run manager far neater and quicker to navigate, however it can be confusing if the particular variable that you want to use is not listed. In particular note that in the case that the user wants to active a internally calculated variable that is not one of the �common variables� as listed above, for example �time into lap�. Since this is not a shown it cannot be activated.